By now I'm sure that all of you are aware of the Versus battle with DirecTV. Both sides have publicly called out the other during the dispute, but the NHL has officially backed the Versus Network's position on more than one occasion. "Versus president Jamie Davis appeared on the NHL Live radio show Friday and discussed the cable network's dispute with DirecTV. 'What [DirecTV officials] wanted to do and what they're insisting on and what they have also not told the public is that they were insisting on a clause that would give them the ability to take Versus away from 6 million existing subscribers by re-tiering it, putting on a different tier and going back and saying 'now if you want to continue getting Versus, which you used to get for free, now you have to pay X dollars more a month,' Davis said. 'That's something we wouldn't accept and that's what this is about.' "
The Versus Network is owned by Comcast... and wasn't it Comcast that just ended an ugly and very public feud with the NFL Network? Does anyone remember what the issue was during that fight? You guessed it! "The battle was between a powerful league aggrieved by Comcast’s relegating its channel to a digital sports tier that cost subscribers extra, and a huge cable operator whose customer base is crucial to a network’s exposure." Therefore, what Versus president Jamie Davis DID NOT mention in today's interview is that it is ok for Comcast to re-teir and charge customers more for a sports package, but not ok for their competitor DirecTV to do it. So you ask, why does the NHL support the Versus/Comcast argument? Well, it just might be speculation but, the Chairman of Comcast/Spectacor is Edward M. Snider. 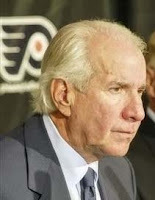 It is the very same Ed Snider that "owns" the Philadelphia Flyers and is a leading member of the NHL Board of Governors. It doesn't take a rocket scientist to figure out how the NHL arrived at their decision to back the network. Again, it is the sports fan that loses out when Comcast and their competition clash. The League would like you to call DirecTV to voice your opinion. Instead, call Ed Snider and tell him to stop obsessing about what the competition is doing. Isn't it pathetic enough that we have to listen to him whine about the Penguins and the NHL Draft every season after they eliminate his Flyers? Now he wants to interfere with our television programming?